“I came upon a rather striking surprise in looking through the texts of earlier Peterson Lectures. Not just one – but two of those addresses in recent years have quoted my grandfather! It was from him, Sir Sultan Muhammad Shah Aga Khan, that I inherited my present role in 1957. I also inherited from him a deep concern for the advancement of education – especially in the developing world….As you may know, the developing world has been at the centre of my thinking and my work throughout my lifetime. And I inherited a tradition of educational commitment from my grandfather. It was a century ago that he began to build a network of some 300 schools in the developing world the Aga Khan Education Services – in addition to founding Aligarh University in India.” (Excerpts from The Peterson Lecture by the current 49th Ismaili Imam, His Highness Prince Karim Aga Khan, grandson of Aga Khan III, to a meeting of the International Baccalaureate, Atlanta, Georgia, April 18, 2008). As a mendicant, I am now going out to beg from house to house and from street to street for the children of Indian Muslims. In December 1910, the session of the All India Muslim Educational Conference at Nagpur gave the signal for a concrete, nation-wide effort to raise the necessary funds for the projected University. A Central Foundation Committee with the Aga Khan III as Chairman and Maulana Shaukat Ali (1873 – 1938) as his Secretary was formed at Aligarh on January 10, 1911. The committee included many other high profile representatives from the Muslim community. The Aga Khan accompanied by Maulana Shaukat Ali toured throughout the country to raise funds, visiting Calcutta, Allahabad, Lucknow, Cawnpore, Lahore, Bombay and other places. It was a triumphal tour. Wherever he went, people unharnessed the horses of his carriage and pulled it themselves for miles. The significant aspect of the Imam’s fund collection drive was not the enthusiastic welcome accorded to him, but the house to house collection drive. Qayyum A. Malick writes in ‘Prince Aga Khan’ (Karachi, 1954, p. 64) that once while on his way to Bombay to collect funds for the university, the Aga Khan stopped his car at the office of a person who was known to be his bitterest critic. ‘I have come for your contribution to the Muslim university fund,’ said the Aga Khan. The man drew up a cheque for Rs. 5000. In sum, the Imam collected twenty-six lacs of rupees by July, 1912 in the drive and his personal contribution amounted to one lac rupees. On October 20, 1920, the Aligarh University was granted its official Charter. In spite of several obstacles, the Aga Khan continued his ceaseless efforts for the Muslim University, and further announced his annual grant of Rs. 10,000 for Aligarh University, which was subsequently raised. Various Ismaili individuals also made their generous contributions to Aligarh University. For instance, Mr. Kassim Ali Jairajbhoy gave Rs. 1,25,000 to found chairs of Philosophy and Science in the Aligarh in memory of his father. It might be noted that in January, 1857, Lord Canning (1856-1862) had passed the Acts of Incorporation in India which provided for the establishment of universities in Calcutta, Bombay and Madras. The fourth university was then established in 1882 by a Special Act of Incorporation in Punjab and the fifth was that of Allahabad University in 1887. Thus, by the end of 1902 there were five universities in India. Aligarh University became the sixth one. 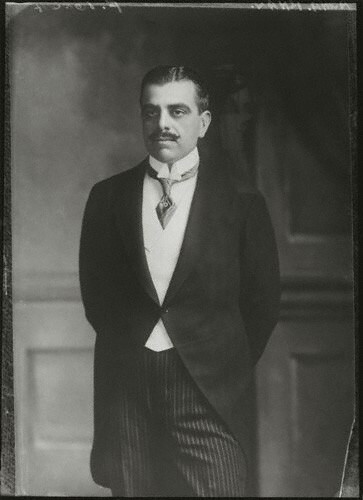 Photo of Aga Khan III shown above is copyright National Portrait Gallery, London. It is by Elliott & Fry, half-plate negative, 1911. Please visit the What’s New page for all articles posted in this website (by date). And do visit the Home page if you are coming from an external link. Voices: Sir Sultan Muhammad Shah, Aga Khan III – Recollection of Imam’s Visit to a Family Shop; A Story about the Diamond Jubilee Scale and…Does it (Still) Work? I am interested to see a picture of Allama Iqbal, the great poet, and others pulling the horse cart of Imam Sultan Muhammad Shah upon his arrival in Lahore for Aligarh University’s fund raising campaign. I remember seeing a photo many years ago in someone’s collection in what was then East Pakistan (now Bangladesh). Very powerful read. Thank you for sharing this enlightening information. This article revived history that I had read and studied in my school days. Good job.